The most beloved moments of my life have been on mother’s lap, listening to the wisdom of the ages fall from her lips. To me this statement sums up what this book is. My grandmother was the one who told the stories in our family. I remember the retellings of Snow White and Cinderella far before the Disney Princess franchise. The dark lurid details of Red Riding Hood, the evil Rumpelstiltskin …. We all remember these tales. However, as children, I don’t think we understood the deep mysteries contained within them. 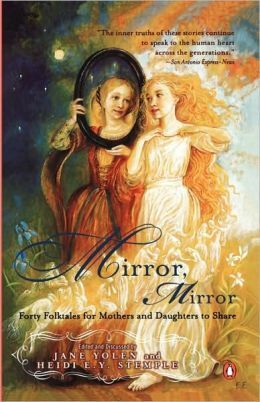 Mirror, Mirror brings these tales into new light, exploring the deep and hidden meanings through conversations between mother and daughter. It is a delightful book, full of humour, wisdom and deep insights that make reading these tales a treat. It was interesting to find so many different versions of the stories. The author(s) included a number of versions spanning the globe, providing an interesting thought while reading: that we as a species, regardless of where we live, create similar tales to inspire, teach and convey truths. This is hauntingly beautiful one. It connects mothers from all different cultures, continents and traditions. This book is one of those ‘handed down’ books that could be passed on from mother to daughter and perhaps added with notes. I found the wisdom shared between the authors who are mother and daughter to be relevant and timeless. The quote “she must separate herself from me, to find which pieces of me she wishes to discard and which pieces she will take on as her own” is one that I found to hold true. We as mothers wish our daughters to be better than ourselves, to be their own ‘woman’ and stand firm against whatever might come. We often strive to be anything like our mothers — but usually end up being more like them than we intended. But the author’s quote holds true: it is the desire of all women to be their own woman free of whatever trappings of the previous generation. I would highly recommend this book to anyone interested in examining folktales and perhaps learning a bit more about how we have been influenced by them.